September 14, 2018 -- Researchers from Johns Hopkins University used a proprietary 3D virtual heart simulator to preoperatively identify areas of cardiac tissue that required surgical treatment for an irregular heartbeat, according to an article recently published in Nature Biomedical Engineering. The method may improve cardiac ablation procedures. 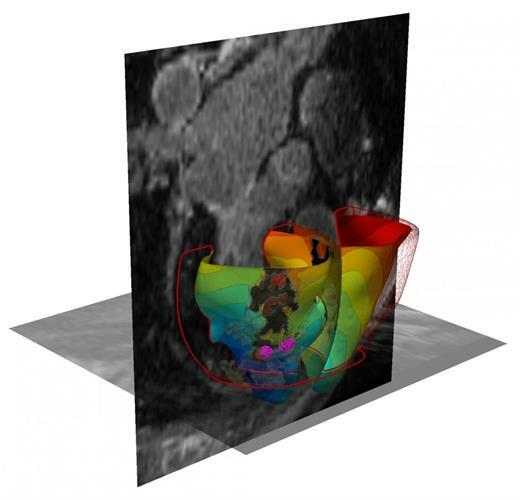 The group, led by senior author Natalia Trayanova, PhD, of Johns Hopkins, developed the "virtual heart" model using a combination of cardiac imaging and computational modeling. The researchers believe this technology could assist in the management of ventricular tachycardia -- a heart rhythm disorder characterized by rapid, irregular heartbeats. 3D virtual heart. Image courtesy of Johns Hopkins University. Traditionally, clinicians treat ventricular tachycardia through cardiac ablation procedures, which involve threading a catheter through the heart and using radiofrequency waves to destroy the tissue that is triggering the arrhythmias. The invasive surgery is complicated by the guesswork and variability involved in pinpointing the exact site causing the arrhythmia, and it's only successful approximately 50% to 88% of the time, the authors noted. Seeking to improve the situation, Trayanova and colleagues acquired MRI scans of patients' hearts and then used computer software to convert the scans into patient-specific 3D virtual heart models. The software incorporated mathematical equations to predict the electrical signaling pattern of each cell in the heart. This allowed the investigators to simulate an ablation on any area of the virtual heart to confirm the presence or absence of an arrhythmia (Nature Biomed Eng, September 3, 2018). They used this technique to locate arrhythmias retrospectively in 21 patients who had previously undergone a cardiac ablation procedure between 2006 and 2017. Using the 3D virtual heart model, the group was able to correctly identify the precise region of problematic heart tissue for every one of the patients. In several cases, they discovered that the area requiring ablation was actually 10 times smaller than the area the surgeons had treated. In a subsequent prospective case study, Trayanova and colleagues used their 3D simulation method to facilitate cardiac ablation procedures for five patients with ventricular tachycardia. Their method proved successful for all three of the patients who underwent cardiac ablation; the three patients remained free of irregular heartbeats several months after treatment. The clinicians determined that the procedure would not be feasible for the other two patients. "Our new study results suggest we can remove a lot of the guesswork, standardize treatment, and decrease the variability in outcomes, so that patients remain free of arrhythmia in the long term," Trayanova said in a press release from the university. Implementing the 3D virtual heart simulation technique may reduce the amount of time patients need to spend undergoing invasive surgery, as well as reduce the likelihood of complications and repeat procedures, she noted. The proof-of-concept study affirms the need for additional clinical trials. The researchers have already received an investigational device exemption (IDE) for their technology from the U.S. Food and Drug Administration (FDA). They plan to continue testing their approach on patients with advanced cardiac disease who may have arrhythmias in multiple areas of the heart.